The interchangeable-lens OM-D E-M1 is so much camera you won't believe it's mirroress. The E-M1 is the successor to 2010's E-5, the last Olympus camera with a mirror box and an optical viewfinder. I just shot with one of the first units in the world at the Oly launch event in New York, and I'm certain that almost no one needs a DSLR anymore. This camera is a serious business photography machine. And we mean serious: Like, people who want to buy a $1400 body and bunches of lenses. The only kit bundle will be a M.ZUIKO Digital ED 12-40mm f/2.8 lens—the first in Olympus' "Pro" line of mirrorless lenses. It won't be available at launch, but when it is, the bundle will cost $$$$$. That's a lot of dollar signs for anybody, and it reflects the evolution of the technology—as well as the evolution of photographers. The beginning of the OM-D E-M1 story is that it's probably the end of Olympus' DSLR format—and don't be surprised if everyone besides Canon and Nikon goes this way as well. The four thirds system was jointly developed by Olympus and Kodak for the production of DSLRs. Olympus released 15 four thirds shooters starting with the E-1 in 2003. The last, the E-5, was released in 2010. All have been discontinued. The 17.3 x 13 mm sensor size is smaller than the APS sensor that's now widely accepted as the minimum standard for DSLRs, and even many APS-based DSLR formats are starting to seem excessive for their mirrors. In 2008, Olympus started releasing its first micro four thirds system cameras, which used the same four thirds sensor size, but with a slightly different lens geometry for a mirrorless camera body. At first, these cameras looked like a race to the bottom on price and size, but that changed about two years ago when mirrorless got good. 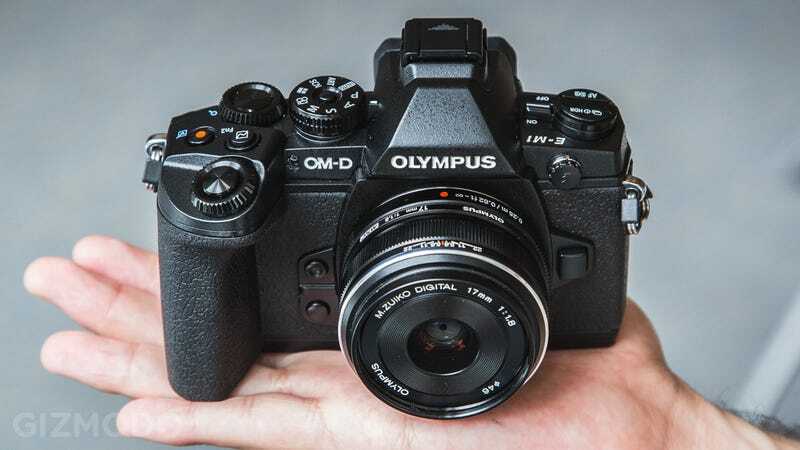 Rumors that Olympus would replace its 2010 E-5 DSLR with a smaller product have been circulating since last year's expensive, full-featured OM-D E-M5 hit the market. Today's OM-D E-M1 announcement shouldn't surprise anyone. The E-M1 will be compatible with the full line of four thirds lenses from before, so if you invested heavily in that system and those old cameras, at least it'll be a little easier to move on. The OM-D E-M1, like Panasonic's GH3, isn't a bitsy mirrorless camera that pretends like it's going to fit in your pocket. At 4.8 × 2.7 × 1.5-inches and 15.2 ounces it's smaller than beginner DSLRs—the Canon T5i measures 5.2 x 3.9 x 3.1 inches and weighs 18.5 ounces—but it's by no means tiny. Start piling on professional accessories like the battery pack and a large telephoto lens (pictured above), and this thing will start to look huge. It's no toy and it doesn't feel like one: The magnesium-alloy body is tough, and weather-sealed so that it's dust-, freeze-, and splash-proof. Compared too much larger full-frame DSLRs, this thing is a shrimp. Photographers who are used to bigger cameras are going to love how much functionality has been built into the E-M1's body without the need for additional accessories or an instruction manual for the camera's menus. Handling the E-M1 is a dream. Tonight was the first time I used a production sample, and despite standing by the river on the deck of an aircraft carrier with very little available light, I was able to find my way around all of the controls fairly quickly. The button layout is amongst the nicest I've handled since back when I tested the massively expensive (and generally massive) full-frame Nikon D800. There is a body-based button and/or dial control for almost every important camera function—Aperture, shutter speed, exposure compensation, white balance, autofocus, ISO, and more. In any given Auto/P/A/S/M shooting mode, the two control dials, one on each the front and back of the body, actually adjust 4 different settings thanks to a smart 1-2 switch that lets you toggle between configurations. There's also a nifty lock button on the mode dial that keeps you from accidentally flipping modes. Everything is also customizable to your preferences. The 2,300,000-dot electronic viewfinder is super high-resolution and adjusts dynamically to the amount of brightness outside. It's very responsive, and I didn't notice any lag. But on the dark deck of the USS Intrepid, the camera juiced the EVF's colors to the point of over-saturation in order to keep up with the scene. A brief try in more normal conditions with a pre-production camera about a month ago yielded better results. There's also excellent hardware that's carried over from other Olympus cameras like the 3-inch, tiltable, 1,037,000-dot touch LCD screen. In about an hour total playing with the camera, I didn't find myself needing to touch the screen at all because the body controls are just begging for your fingers. It's nice to have the option though. Because we live in the smartphone world, the E-M1 has built-in Wi-Fi connectivity that allows you to easily transfer your photos to a handset as well as to control select camera functions. And I have barely learned how to use the camera or bothered to develop the 12-bit RAW files in software yet. A little cleaning, and even that top shot might come out. I was also impressed with camera's 5-axis image stabilization, which Olympus claims will give you five stops of steady. That means that if you're like me and you shouldn't really shoot at shutter speeds slower than 1/60 second at the risk of shaky photos, suddenly 1/2 second is a realistic possibility. In the dark aboard the good ship junket, we were supplied with tripods, but I found myself frequently pulling the camera off the mount or even holding the whole kit and caboodle in the air to get a shot without detecting blur, even at slow shutter speeds. The E-M1 features a new "Dual Fast" autofocus, which replaces the already dope "Fast" AF on the E-M5. What this jargon means is that like most other mirrorless cameras out there, Olympus is finally using both contrast and phase-detect autofocus. The 37-point phase detection system is entirely new, and is the only system that works with the older four thirds lenses. The 81-point contrast system intended for use with the micro four thirds lenses is a lot more robust on paper than the 35-point system available on previous Olympus cameras. It's unclear from the product literature if the camera ever goes fully-hybrid and uses both AF systems. Other manufacturers like Canon and Sony excel in this area, and it appears the E-M1 doesn't quite get there. Because of the darkness and massive depth-of-field I was shooting in/at tonight, I found myself frequently toggling back to the manual focus for better precision than what the AF could deal with. (Thank the lord for the focus peaking display.) I didn't get a sense for how well the AF system worked under less strenuous conditions. Unlike Panasonic's video-centric GH-3 micro four thirds camera, the E-M1 is definitely designed primarily for photographers. Its video specs are pretty limited, shooting only 30 fps at Full HD 1920 x 1080 resolution. As a company, Olympus' cameras have been heading towards the more powerful mirrorless zone for some time, and more generally, there's a trend towards this. The OM-D E-M1 certainly isn't alone, when you consider the excellent interchangeable-lens shooters released in recent years by Sony, Panasonic, and yes, Olympus. The technology is getting good enough that inexpensive DSLRs no longer really make sense. Once upon a time, "real" photographers would have cringed at the thought of using an electronic viewfinder, but that's just not the case any more. Sure, certain pros will always demand the top full-frame DSLRs, but as mirrorless keeps getting better, most people will be able to get by without a DSLR at all.